We pride ourselves on locally sourced good honest food made with love, by Serendipity Street. We have divided our menu into themes but you can choose any dish from all of the below, to suit your event. As we live on Perrydown Farm, we thought we’d share with you a little insight in to the Serendipity Street larder. All served with a choice of sides incl. Salad, Potato & Vegetable options. All served with a choice of Cream, Vanila Ice Cream or Custard. We all love going to the British coast, on a Summer’s day. Nothing can beat a punnet of chips or a classic ice cream cone. Here’s some of Serendipity’s sea inspired favourites. What could be more befitting than a grand picnic for an outdoor wedding or garden party. Alfresco dining in Britain has always been a treat, so why not take a look at some of our seriously indulgent ideas, for a more rustic experience. This could be served with Picnic Blankets and Baskets. Serendipitous Picnic A Selection of Interesting Chunky Sandwiches & Pastries. 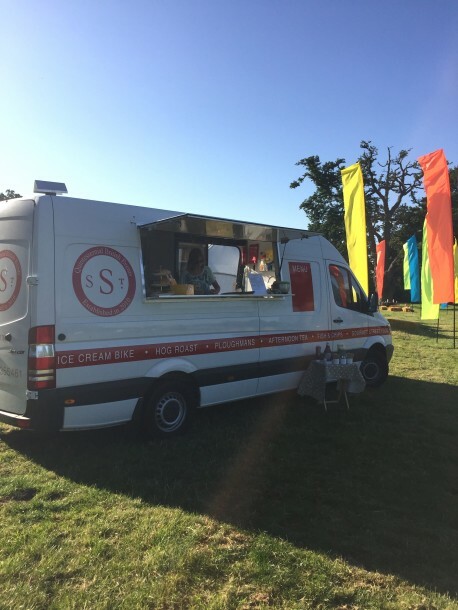 Ice Cream Served in a Traditional Sugar Cone, from our Vintage Ice Cream Bike. When you stumble across a great pub in the British countryside that offers seriously delicious food, let’s bring it to you. Feast away at some of our favourites, inspired by Suffolk’s village pubs and restaurants. * Served with a choice of Cream, Vanilla Ice Cream or Custard.